In a distant age of darkness – circa 2003, I believe, long before I started blogging – I wrote a history of Middle-earth for another project. Drawing on The Silmarillion, Unfinished Tales and The History of Middle-earth series, my goal was to put together a concise history of Arda as envisaged by J.R.R. Tolkien. As always, my idea of "concise" was at variance with others (at over 40,000 words it is close to a third of the length of The Silmarillion itself!) so the project was shelved. But, having recently gone through my archived files, I dusted it down and realised that, with judicious re-editing (it turns out that 14-years-younger Wert had a much greater love of the word "Thus") it stands as a reasonable approximation of a history of J.R.R. Tolkien's world. Or at least as reasonable as my much-younger self could make of it at the time. The World of Arda. Artwork by Gordon Theobald. "Canon" is a fluid concept when it comes to the Middle-earth legendarium. The only works that can be considered fully, 100% canon are the two works that J.R.R. Tolkien wrote, completed and published in his lifetime: The Hobbit (1937) and The Lord of the Rings (1954-55). Tolkien died in 1973 with The Silmarillion still incomplete and his son and literary executor Christopher had to create a "best guess" version by drawing on a morass of incomplete outlines, timelines and narratives (aided for a time by Guy Gavriel Kay). The Silmarillion was published in 1977 and it is this book that serves as the inspiration for this history. However, during the editing of The History of Middle-earth series, which sought to publish every writing and draft J.R.R. Tolkien ever conceived for Middle-earth, Christopher uncovered some other documents not available during the writing of The Silmarillion-as-published which he admits would have influenced the book to go in different directions if he'd known about them at the time. Unfinished Tales, published in 1981 and consisting of essays and stories not intended for The Silmarillion, but for a vaguely-projected companion volume of Middle-earth miscellany, complicated matters even further. Several of the essays in this book were Tolkien's works-in-progress at the time of his death, most notably a radical reconception of the history of Galadriel and Celeborn (in which they would get a solo adventure in The Silmarillion, leading them to Middle-earth separately to the rest of the Noldor), a much more detailed account of the history of Numenor and more detailed prose accounts of the legends in The Silmarillion (the later-published Children of Hurin and Beren and Luthien draw on these versions). Since Tolkien was unable to complete these rewrites, this narrative history therefore reverts to the traditional Silmarillion versions. However, some elements from The History of Middle-earth and Unfinished Tales are drawn upon to add flavour or detail, where they do not clash with other sources. Four principal calendar systems are used to chronicle events in the history of Middle-earth. Years are dated in the Ages of the World, also called the Ages of the Sun. Millennia uncounted took place prior to the first rise of the Sun and Moon, but these years, the Sunless Years or Ages Before Sunlight, go uncounted because, with no Sun, there was no way to count the passing of the years (though according to the Valar, whose knowledge outstrips all others, approximately 30,000 years of later reckoning passed between the creation of the world and the first sunrise over Arda). Obviously, the events that took place at this time are recorded here for discussion. There have been four Ages of the World that have passed since the rise of first sunlight. The First Age began with the rise of the Sun and Moon and ended in the War of Ruin which destroyed the subcontinent of Beleriand and saw the Dark Lord Morgoth cast into the Outer Darkness. The Second Age ended with the downfall of Sauron in the Last Battle of the Last Alliance on the slopes of Mount Doom. The Third Age ended when the last of the high elves departed Middle-earth for Valinor. The Fourth Age then began, after which details of history become unclear. Years counted in SA, TA and FA stand for Second Age, Third Age and Fourth Age, obviously. To avoid confusion between the First and Fourth Ages, dates in the First Age are counted as ED, being part of the Elder Days. There is another calendar which comes into use near the end of this history. SR stands for Shire-Reckoning and counts the history of that curious country known as the Shire. SR is of interest because it extends across both Third and Fourth Ages and is particularly relevant to many who played a major role in the epic War of the Ring at the close of the Third Age. The principal source for any history of Middle-earth is The Red Book of Westmarch. This red-clad volume was written by Bilbo Baggins, partially whilst still in the Shire but mainly during his twenty-year sojourn in Rivendell. Of course, virtually all of the material on the Elder Days, Númenor and the Rings of Power comes from earlier sources, including discussions Bilbo had with Elrond, Galadriel and Celeborn (during their occasional visits to Rivendell) and translations Bilbo made from books written in Quenya and Sindarin. Frodo Baggins continued the book back in the Shire after the War of the Ring, filling in his and his companions’ adventures during the conflict. After Frodo departed over the Sea, it fell to Samwise Gamgee to keep the book in order. Quite separate from this source, numerous books were written in Arnor and Gondor on their histories and the history of Númenor, and many of these survived. Other, rarer records, including many believed destroyed, were recovered from Isengard after Saruman’s departure. The elves contributed many historical accounts and books of legends, as did the dwarves. After the dwarves reoccupied Khazad-dûm following the death of the last balrog, other ancient records were recovered from those halls not spoiled by the orcs’ occupation. The problem of historical drift is much less reduced by the extreme longevity of the elves: almost 7,100 years passed between Galadriel’s departure from Valinor and her return, for example, whilst by the end of the Third Age Círdan, the Keeper of the Ships at the Grey Havens, had lived for perhaps 15,000 years. With almost perfect memories, the wisdom of the elves has gone a long way to maintaining perfect historical accuracy over the passing of the centuries and millennia. Before time began, the One Eru, whom the elves call Ilúvatar, dwelt alone in the void. From the darkness, he conjured the spirits known as the Ainur, and forged the timeless halls for them to dwell in. 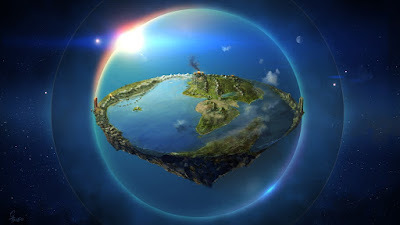 For a time, there was peace and light, until Eru called the Ainur together to work on a mighty theme, a tremendous anthem of music, and out of this theme was born the World of Earth, Arda as it is called in the old tongues. But Melkor, mightiest of the Ainur, determined to make his own mark upon this world, and brought his own music into the theme, creating disharmony. Eru perceived this, and he and Melkor strove for control of the theme. The other Ainur, believing it to be but a friendly contest, watched and cheered on, but the result was inevitable, and Eru gained the victory. Melkor accepted graciously, but for the first time his pride was damaged, and his defeat was something he came to dwell on. Now Eru asked that the Ainur send some of their number down to Arda, and order it in preparation for the coming of his Children, beings devised of his spirit but of a lesser order to the Ainur. Many of the Ainur agreed, and they descended unto Arda in a great host. Upon the world of Arda, the Ainur became divided into two orders, the Valar or “Powers”, and the Maiar or “Hands”. The Valar were the greatest of all beings upon Arda and the Maiar were their servants. Of the Valar there numbered fourteen: Manwë, Melkor, Ulmo, Aulë, Oromë, Mandos, Lórien, Varda, Yavanna, Nienna, Estë, Vairë, Vána and Nessa. Of the Maiar there was hordes uncounted, including the herald Eonwë, the sorcerer Thû, Ossë Lord of the Coasts, Uinen Lady of Waters, Ilmarë handmaiden of Varda, Melian the gardener and Olórin the wise. At first the world was in harmony and all the Valar and Maiar worked together in peace, but before long the rage and frustration of Melkor came to the boiling point and he began to despoil all that the Valar had wrought, unleashing fire and destruction, earthquakes and terror, just because he could. The Valar were at first in confusion, then despaired as hundreds of Maiar flocked to Melkor’s banner, among them the dread sorcerer Thû (also called Gorthaur the Cruel), the fire-lord Gothmog and his hordes of Valaraukar, who in later years were called the balrogs. The First War of Arda was a ruinous one, but in the end the Valar rallied. After begging the favour of Eru, the Ainu Tulkas, Lord of Might, gained permission to come unto Earth and join the Valar, and Tulkas’ strength turned the tide of battle, and drove Melkor and all his hordes of darkness into the remotest regions of the north. Thus, Tulkas was welcomed amongst the Valar and counted in their ranks, and Melkor was outcast. For a time, peace ruled upon Arda and the Great Lamps of Light were raised, Illuin and Ormal. Between them lay a vast lake, and the Valar built a city called Almaren upon an island in that lake. And again, they returned to the task of transforming Arda into a beautiful garden paradise. But Melkor and his minions cried out against the light, for already their thoughts turned towards the darkness. Melkor raised a great chain of peaks known as the Ered Engrin or Iron Mountains around the remotest parts of the north of the world, and under their tall peaks he forged the fortress of Utumno, but even from its darkest pits the light of the lamps could still be seen. Again, Melkor came forth in wrath. He assailed the lamps and cast them down. Darkness filled the world, blocking the Valars’ attempts to fight back, and earthquakes wracked the land. In the end, the Valar decided to remove themselves from Melkor’s evil. They created two vast seas, dividing the world into three great landmasses. In the far east lay the Sunlands, from which only rumour came to the rest of the world, whilst in the furthest west the land of Aman took shape. The Valar retreated to Aman and raised the vast towering peaks of the Pelori to guard against Melkor’s assaults, and made a new home beyond those mountains. The central continent they left to Melkor, and that continent became known as Endor or Endorémma, which in the ancient languages is translated as Midland, the Land in the Middle of the Earth, or Middle-earth. Now the Valar had peace for many thousands of years. Beyond the tall walls of the Pelori they founded their kingdom of Valinor and forged mighty cities, such as Valmar their capital, but mostly the Maiar dwelt here, for the Valar had their own homes. Manwë, Lord of the Valar, and his Queen, Varda, made their home upon the Taniquetil, the greatest mountain in the range of the Pelori, whilst Lórien removed himself to a great garden in the west of Aman. Aulë the Smith delved into the deep places of the earth to build his forges, whilst Ulmo dwelt in the seas about the shores of Aman. Mandos, Lord of Doom, forged his halls in the furthest west of Middle-earth, before the Door of Morning, and Yavanna planted her fields and pastures beneath the looming peaks of the mountains. After they first arrived in this land, Yavanna conjured from the Earth the two Great Trees of Light, which were named Telperien and Laurelin, and their radiance filled all of Aman with light, but even their great radiance could not cross the Pelori and the Belegaer, the Great Sea, to Middle-earth. Thus, began the First Age of the Trees in Aman, which in Middle-earth is known as the Age of Darkness. This was the age of the dominion of Melkor, for his forces ruled over all of Middle-earth with no challenge. To his servant Thû, who some called Gorthaur but who also took the name Sauron, the Accursed, he committed the task of building an armoury, for Melkor suspected that war against the Valar would come again. Sauron went into the west of Middle-earth and there built the fortress of Angband. Fierce were its defences and numerous its defenders, but it was but the palest shadow of the might of Utumno in the east. In Aman, the long ages of peace passed, and the Valar turned their hands to creation. Up to now they had created animals and other lower-order creatures, but Aulë and Yavanna became more ambitious. Aulë created a race of sturdy, squat humanoids and imbued them with a love of artifice and creation. He named them the Naugrim, which is often translated as “dwarves”. Yavanna imbued with life the very trees themselves, creating mighty, primitive but beautiful entities called the Huorns, and also created a race of shepherds to protect them, the smaller, more intelligent Ents. But Eru the One had forbidden sentient life to come into the world of Arda before the coming of his Children, and he forbade life to the dwarves, huorns and ents. The huorns and ents were placed dormant in the midst of the great forests of Middle-earth, and the Seven Fathers of the Dwarves were placed in deep places far below the surface of Middle-earth. Thus, the Age of Darkness passed, until Varda, Queen of the Valar and Lady of the Skies, came to weep for the lands of Middle-earth, denied the light of the Trees and shadowed in darkness from Utumno as well as the endless night. She decided to let light flood into Middle-earth and created the Net of Stars to cast across the Outer Airs of the world. The Stars were created, and their light, faint but discernible, blazed down upon the world of Arda, thus ending the Age of Darkness and beginning the Age of Starlight. The stars shone and the servants of Melkor cowed at this sign of the might of the Valar. But, unbeknown to all, the first shining of the stars had other effects. In the furthest east of Middle-earth, on the shores of the Mere of Cuiviénen, the first shining of the stars awoke the First Children of Ilúvatar. These were the Quendi in their own tongue, but history records them more famously as the elves. Strong, tall and graceful they were, immortal, immune to disease and ageing so slowly as to not be discernible, and only killable in battle. The elves lived for many years in peace in Cuiviénen. Some of their kind became curious and set out to explore the lands to the west and north, but of these few returned. Melkor’s spies captured some of the elves early on and delivered them to Utumno, where Melkor became disgusted with the nobility and beauty of these creatures, clearly creations of the One. Enraged, he perverted and corrupted the elves, breeding from them a mutilated form of life known as the orcs. Capable of breeding quickly, the orcs began to increase in numbers to tremendous levels. After the Awakening of the elves, Eru awoke the dwarves, huorns and ents also. The dwarves escaped notice for many long millennia, and the huorns were barely recognised as living beings by the orcs, but the ents soon found themselves assailed. Many were captured and taken in chains to Utumno, where from them Melkor bred the evil race of trolls. Now Oromë the Huntsman, who alone of the Valar often ventured into Middle-earth to hunt servants of Melkor, came across the elves of Cuiviénen. Sensing that these were indeed the First Children who’s coming the Valar had waited for long ages of the world, he dwelt amongst them and learned much of their kind. But Oromë also learned of the evil of Melkor, and in a rage returned to Valinor. He summoned the Valar to the Circle of Doom in Valmar itself, and there presented his findings to all, including Manwë. Then the Valar agreed that the evil of Melkor could not be permitted to harm the First Children. They resolved to go to war. Melkor had no warning of the sudden, swift strike from across the seas. Barely was he warned before Tulkas the Mighty uprooted the mountains protecting Utumno and tore the fortress apart almost by himself. Melkor’s servants fled in terror and their master was chained. He was then taken captive and delivered to a deep pit below Valmar, to there reflect upon his crimes. Then the Valar went before the elves and offered them a choice: to remain in Middle-earth and make their own lives, or to journey with the Valar to the Undying Lands and dwell there with the Valar in their paradise homes. A few refused, fearing the unknown, and remained in Cuiviénen, and these became known as the Avari, or ‘Unwilling’. But the overwhelming majority of the elves did agree to pass into the west, and set forth on the long road. The elves moved in three hosts. The first was led by Ingwë and was known as the Vanyar. The Vanyar were closest to the Valar in thought and deed and hurried quickly to the shores of Beleriand, the western-most part of Middle-earth, where the shores of Aman and Middle-earth drew closest. The second was led by Finwë and was known as the Noldor, or deep-elves. These elves loved artifice and creation, and stopped along the route to talk to the dwarves they met along the way, but they were more intrigued by news of the great smiths and forges of Aulë that awaited them in Valinor, and they did not tarry long. The third host was the largest, and was led by the brothers, Olwë and Elwë. This host was known as the Teleri, and tarried often upon the road, often splitting into lesser groups, some going their own way only to rejoin the main group later on. The Teleri were divided between staying in Middle-earth and going to Aman, or between rushing to the Hither Shores after the Vanyar and Noldor, or going at a more sedate pace and exploring leisurely other parts of the world. After many years had passed and Ossë, vassal of Ulmo, had already departed for Valinor, pulling a great island with the hosts of the Vanyar and Noldor upon them, the Teleri host at last came before the mighty Hithaeglir, the impenetrable chain of mountains later called the Misty Mountains. Raised in earlier millennia by Melkor to hamper Oromë’s journeys in Middle-earth, the Misty Mountains presented a formidable obstacle to the elves. Some turned back, fearful of the great peaks, and became known as the Nandor, “Those Who Turned Back”. But the bulk of the Teleri pressed on, following the Misty Mountains south to a great gap between its peaks. Thus, the Teleri in their descriptions divided the great mountain chain in two, naming them the Misty Mountains in the north and the Ered Nimrais, the White Mountains, in the south. So, they passed into Eriador. The Nandor passed much further south, eventually coming to the coast of the sea at the mouth of the Great River Anduin. Then they turned west along the sea, crossing the steep foothills of the south-western White Mountains and passing into south-eastern-most Eriador by a different road to their kindred. Some remained in Eriador, finding the vast Huorn and Ent-inhabited woods of the land to their liking, but a few pressed on westwards to the Ered Luin, the Blue Mountains. By chance they found a narrow pass leading down into a beautiful, verdant country fed by the waters of seven rivers, and they remained there, becoming the Laiquendi or green-elves, and they named their new home Ossiriand, which in later ages was called Lindon. 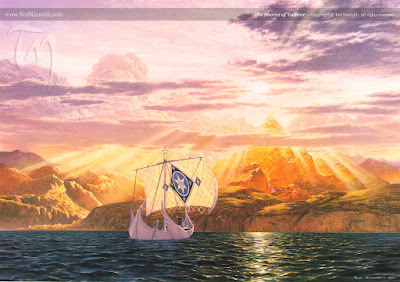 The main Teleri host had already passed into Beleriand ere the Laiquendi arrived in Ossiriand, and were disheartened to find that the ship-isle of Eressëa had departed without them. Knowing it might be many years before the island returned, they spread out along the coasts of Beleriand and explored the interior of this country as well. One of the oldest among the Teleri, Círdan, developed a love of the sea and became a mighty shipwright. He founded the castles of Eglarest and Brithombar, and built many great ships. When the time came to depart Middle-earth for Valinor, he refused and decided to remain in the Falas (the coastlands of Beleriand) with those who would follow him. More serious to the Teleri was the loss of Elwë. He wandered far into the heartland of Beleriand and vanished, and those who sought him also disappeared, but in long years afterwards it was revealed that Elwë had passed into the great twin forests of Neldoreth and Region, and there under the starlight met the Maia Melian, who often visited this spiritual place. They fell in love and Melian adopted elvish form so she and Elwë could be together. They gathered others to them, and founded a kingdom they called Eglador. In time Ossë returned, towing the mighty island of Tol Eressëa behind him, and those Teleri that remained loyal under Olwë boarded the island-ship and passed west over the Great Sea of Belegaer to Valinor. Many of their kindred they left behind, those who stayed willingly and others who had tarried on the way and become lost, but still the host that set foot in Valinor was still larger than the Noldor or Vanyar. So did the last of the Eldar, the elves of the Great Journey, come to Valinor. For many long ages both the Valar and their elven guests in Valinor and the elves of Beleriand had peace, for Melkor was imprisoned in chains, and his servants quailed in fear of the Valar, and made no move against them or their elven allies. But Sauron, in great secret, foresaw that his master would escape the Valar’s clutches if he could and return to Middle-earth, and Sauron gathered to him all of Melkor’s creatures, and Angband he strengthened further, in preparation for that day. In Valinor the Eldar dwelt in peace. The Vanyar and Noldor took for themselves the city of Tirion, which they built on the great hill of Túna in the midst of the Calicirya, the Pass of Light through the Pelori, linking the inner plains of Valinor to the Bay of Eldamar. In the midst of that bay lay the great island of Tol Eressëa, the Lonely Isle, which had borne the Eldar from Middle-earth, and on the northern shores of the bay the Teleri founded Alqualondë, the Swan-haven, from where their great swan-ships set out to explore coasts of Aman and the seas of Arda. In time, the Vanyar’s piety to the Valar was rewarded, and they were permitted to move from Tirion into Valmar itself, and Ingwë, King of the Vanyar and Lord of the Eldar, was permitted to build himself a mansion on the lower slopes of the Taniquetil, thus signifying the deep bond between the Vanyar and Manwë Lord of the Valar. However, the Noldor were not so blessed. They were not permitted to settle in Valmar, but were allowed to build for themselves another city on the inner plains of Valinor, and this they named Formenos. The Lord of the Noldor, Finwë, had three sons, Fëanor from his first marriage to Míriel Serindë and Fingolfin and Finarfin from his marriage to Indis of the Vanyar. Míriel was exhausted by childbirth and went to rest in the gardens of Lórien, but so great had her exertions been that she laid herself down and her spirit passed to the Halls of Mandos, not to return, the first of the Eldar to perish in Valinor. Finwë was grieved, but in time learned to love again and took Indis to wife, and had two more sons. But between Fëanor and his brothers there was jealousy and dislike. After thousands of years uncounted passed, Melkor begged for an audience before his brother Manwë and Manwë relented. Melkor threw himself on his brother’s mercy, begging to be let loose from his chains and declaring his repentance at his crimes. Manwë eventually agreed, but through true belief that Melkor had repented or through a belief that the Valar could contain Melkor’s evil should it spring forth anew remains unknown. Indeed, if Melkor himself repented truly or merely feigned servitude is also unknown. In Formenos Fëanor grew to become the greatest of all Noldor smiths, but his jealousy of his brothers continued to consume him. Out of this petty malice many great items of power were forged, and Fëanor was acclaimed when he forged seven seeing-stones of great power, the palantíri. But, although they were wondrous, Fëanor felt they were but minor heirlooms at best, and continued his quest for perfection. Eventually he succeeded in capturing the truth of beauty, for he forged three great jewels of everlasting perfection, and inside he captured the light of the Great Trees themselves. Thus were born the Silmarilli, the Silmarils, the most perfect items ever created by the elves upon Arda. All who saw them, even Manwë himself, were captivated by their beauty. But none were more ensnared by their radiance than Melkor. 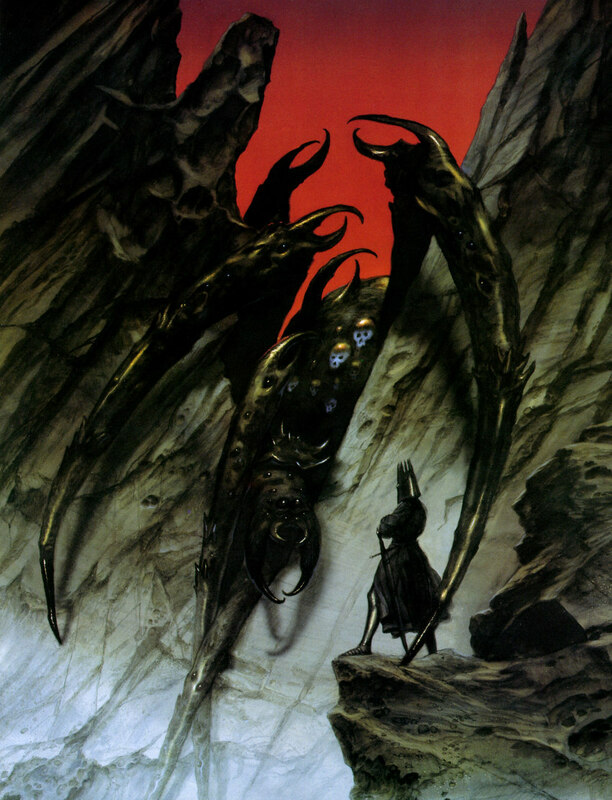 In great secret Melkor journeyed into the southern-most regions of Valinor and there, under the peak of Hyarmentir, found one of the most ancient forces in the world, Ungoliant the Terrible, a great spider of tremendous strength and avarice, and Melkor bound her to his service once more with a promise of destruction to sate her dark hunger. A time came when a great feast was to be held in Valmar, and all the Eldar were invited. Even Fëanor forgot his petty jealousies and went with his brothers to the feast, and there most of the Teleri and Vanyar went as well. But Finwë, Lord of the Noldor, did not go. His son Fëanor had been banned from visiting Tirion for a period of twelve years for openly speaking of defying the Valar and returning to Middle-earth. Finwë vowed not to step forth from Formenos until Fëanor was granted pardon. The great feast of Valmar began, but it had not long been in progress when Ungoliant and Melkor came forth from the southern mountains. With his mighty spear, Melkor cast down the Trees of Light themselves, and Ungoliant defiled the mound where they grew, so never again could they be grown. Then Ungoliant weaved a great shadow around herself and Melkor and they passed northwards at speed. They came to Formenos and shattered the doors of the fortress. There Finwë stood fast, sword in hand, but his valour was in vain, for Melkor slew him, shattered the storerooms of Fëanor, and seized the Silmarils. He and Ungoliant, clad again in shadow, then went forth into the uppermost north of the world and passed over Helcaraxë, the Grinding Ice, and travelled on towards Beleriand. Now all the Eldar and Valar were dismayed. Fëanor drew his blade and declared that Melkor was now Morgoth, the Great Enemy of All the World, and swore to revenge himself upon Morgoth even if it took to the end of the ages of Arda. He committed his seven sons (Maedhros, Maglor, Celegorm, Caranthir, Curufin, Amrod and Amras) to the oath of vengeance, and his brother Fingolfin and his own two sons and one daughter (Fingon, Turgon and Aredhel) also joined the call. Finarfin, most peaceable of the brothers and the closest to the Valar, hesitated, but after much thought joined the oath-swearing, committing his four sons and one daughter (Finrod, Orodreth, Angrod, Aegnor and Galadriel) to the return of the Silmarils. But the Valar forbade the Noldor from leaving. They ordered them not to leave the Undying Lands, for Morgoth was now the concern of the Valar for casting down the Trees of Light and betraying the oath of peace he had sworn before Manwë. But the Noldor did not listen. They gathered their hosts and marched east to Alqualondë. There the Teleri refused to surrender their swan-ships to the Noldor and even burned some rather than defy the Valar. In a righteous fury, Fëanor led his sons into battle against their own kindred in the First Kinslaying and even some of Fingolfin’s troops entered the fray as well. Finarfin held back his host, dismayed at what he had seen, and many of his kin turned back to Valinor in disgust. But at length the slaughter was done and the Noldor had ships enough to carry one half of their host. They sailed north, whilst Fingolfin and Finarfin led their hosts north along the coast by land. Then, at Araman in the north of Aman, the voice of Mandos prophesied the Doom of the Noldor, cursing them to walk in death’s shadow forever for the evil they had unleashed upon the world. Fearful, Finarfin’s will at last broke and he abandoned the chase, leading his host back to Valinor, whilst his children remained. But Fëanor and Fingolfin would not relent. Fëanor took the ships across the north of the Sea of Belegaer, promising to return them for Fingolfin’s host. But upon reaching the Hither Shores of Beleriand, Fëanor’s wrath took hold of him, and he ordered the ships burnt. So many ships were destroyed that day that their flames could be discerned even across the wide sea, and Fingolfin knew he had been betrayed. With little other choice, he led his people onto the Helcaraxë, and began the cruel passage of the Grinding Ice, which claimed many of the lives of the host. In Valinor the Valar gathered around the fallen Trees, knowing they could grow no more, but from the last embers Yavanna kindled two saplings of light, one fierce and burning, one pale and ghostly, and Aulë the Smith fashioned two great orbs to carry and amplify the lights. Arien, maiden of the Maiar, was chosen to pilot the burning orb, Anar they called it, the Sun, and Tilion, the hunter of the Maiar, was chosen to pilot the ghostly orb, Isil, the Moon. As the Sun and Moon rose into the skies for the first time and brought full-wrought day into the lands of Middle-earth for the first time, so the shadow of the host of Fingolfin fell upon the land of Hithlum in the north-west of Beleriand and, under the light of the Sun, Fingolfin entered Beleriand, vowing vengeance against both his mortal enemy Morgoth and against his treacherous brother Fëanor. The War of the Jewels had begun. Thank you for reading The Wertzone. To help me provide better content, please consider contributing to my Patreon page and other funding methods, which will also get you exclusive content weeks before it goes live on my blogs. The Cities of Fantasy and History of Middle-earth series are debuting on my Patreon feed and you can read them there one month before being published on the Wertzone. Thank you. I really enjoyed reading the first part.